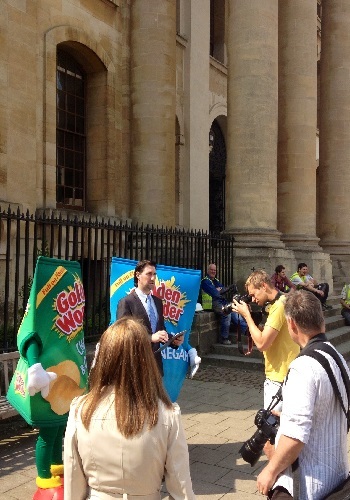 Golden Wonder Commerical - We've Got Talent. The Golden Wonder commercial was one of the most interesting productions we have supplied artiste for since ‘We’ve Got Talent’ has been established. We provided a variety of background extras who were portrayed as different characters and some costumer performers. 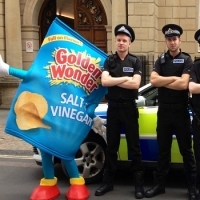 The roles we cast for were extras to portray police officers, solicitors and performers to wear giant crisp packet costumes. The client gave us a brief for the type of people they were looking for including build and playing age. We sent over profiles for them to choose from and then pre-briefed the successful candidates so they arrived to set ready to go. 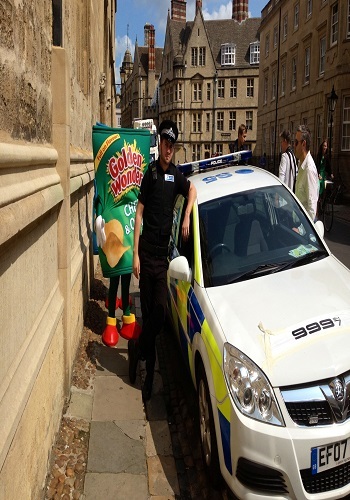 We supplied three extras who were playing the role of a policemen, they were to patrol the streets and then jump into their police car. 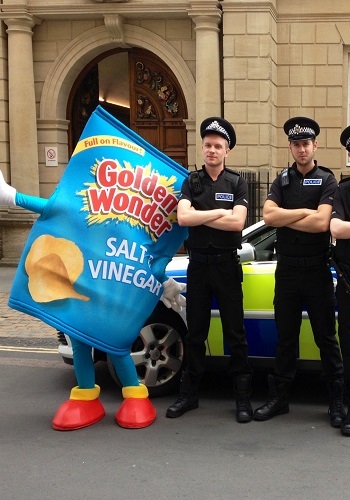 They then had to pursue two costume performers dressed as packets of Salt & Vinegar and Cheese & Onion crisps. 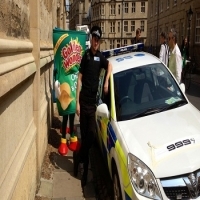 Finally the roles of solicitors who were to defend the packet of crisps in court. 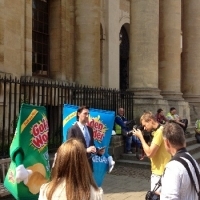 The aim of the commercial was to get the brand noticed not only online but also around the streets of London. The costume performers really got into character when roaming the streets of London getting a lot of attention from the public who kept stopping them for selfies and photographs on route. All the actors we provided have been working for us for many years which means they know how to take direction and improvise when required. All the artistes made commercial filming team really easy by following our brief that was given prior to the event, all of the team had a great time both filming and acting. The commercial was a massive success for both We’ve Got Talent and Golden Wonder who received great feedback on the final product, the advert was a major hit online.